The lemon shark is a large-bodied shark that is easily distinguished by its relatively large dorsal fins and yellow-brownish skin. Once one of the most common shark species on both sides of the Atlantic Ocean, the lemon shark has been reduced to low densities in the waters off West Africa. Luckily, it remains fairly common throughout the Caribbean region. The species is barely targeted in Caribbean commercial fisheries, although it is frequently caught in US recreational fisheries. The major threat to lemon shark populations is probably the degradation of essential habitats such as mangroves and shallow reefs. 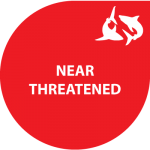 With the actual status of global populations largely unknown, the lemon shark is now listed on the IUCN Red List as ‘near threatened’ with extinction. Throughout its geographical range, from the Eastern coast of the United State down to Brazil, the lemon shark mainly occupies the surface waters and waters down to a depth of 92 meters. They prefer the shallow, coastal waters of the tropics, where you can find them close to coral reefs, on sandy bottoms, and between mangrove fringes. Especially the juvenile individuals are often associated with shallow mangrove habitats as they provide ample food and shelter for the growing sharks. They also provide a hiding place away from larger adult lemon sharks, which are known to be cannibalistic and preying on the young. Generally, the lemon shark’s diet consists mainly of bony fishes, supplemented with crustaceans and mollusks. The similar-looking sharptooth lemon shark or sicklefin lemon shark (Negaprion acutidens) is closely related to the lemon shark and occupies a similar habitat in the tropical waters of the Indian and Pacific Ocean. The species that we are highlighting here only occurs in the Atlantic Ocean and the Eastern Pacific. Within the Dutch Caribbean, this species has been documented on Aruba, Curacao and St. Maarten, and since two years, juvenile lemon sharks are observed around St. Eustatius. At birth, lemon sharks measure around 60-65 cm and can grow to a maximum reported size of 340 cm. Males mature at a length of approximately 224 cm, whereas females mature at a larger size of approximately 239 cm. The age at which the sharks reach these lengths (and thus reach maturity) was estimated to be 11,6 years and 12,7 years for males and females respectively. The maximum reported age for this species is 27 years, which officially makes the lemon shark a slow-growing, long-lived fish species. Something that is studied extensively about lemon sharks is the presence of different personalities between individuals and the ability to learn new behaviors. 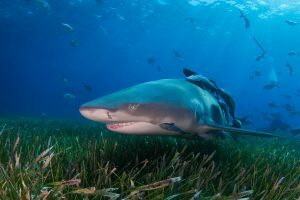 Lemon sharks turn out to be highly social animals and their social behavior is much more complex than previously thought. This knowledge provides a lot of insight into the species, as their social behavior can affect their growth rate, survival and the probability of capture by humans. This is important information to have when trying to improve the population and conservation management programs. Fun fact about the lemon shark! Juvenile lemon sharks are often restricted to very small home ranges of less than 1.5 km2. The size of this area increases when the sharks grow bigger, which means that along its lifetime, the distances that the lemon sharks cover become greater and greater! And this doesn’t just apply to lemon sharks. More and more studies find similar results for other shark species.